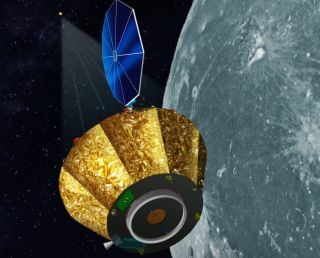 An artist's rendition of the Lunar Occultation Explorer (LOX) spacecraft, a proposed mission for NASA's Medium-class Explorer (MIDEX) program. Earth's moon could help scientists locate exploding stars in the Milky Way galaxy and beyond, according to the creators of a proposed space science mission. The Lunar Occultation Explorer (LOX) would orbit the moon and scan the sky for high-energy light called gamma-rays; in particular, the instruments would look for light that is produced by a particular type of exploding star that's called a Type Ia supernova. "It's been a wish for a long time, really since before we went to the moon, to see what we could do to leverage the lunar environment as a platform for astrophysics," Richard Miller, a professor of physics at the University of Alabama in Huntsville, and leader of the LOX mission proposal, told Space.com. "And while we've gotten very good at space-based astrophysics platforms, like the Hubble Space Telescope, for example, if one wants to go to the moon, there has to be a really good motivating reason that you want to do your astrophysics there." Miller thinks that he and his collaborators on LOX have come up with a pretty good reason to send an astrophysics spacecraft into orbit around Earth's nearest natural satellite. LOX currently only exists on paper, but in the next six months NASA could decide to move ahead with making the mission a reality. LOX's primary mission would be to locate and study a type of supernova called Type Ia. These stellar explosions are thought to occur when a white dwarf (a collapsed star that is still fairly hot) starts siphoning material away from a nearby companion star. The material accumulates on the surface of the white dwarf, building up internal heat pressure, ultimately causing the entire white dwarf to explode and become a supernova. The instruments aboard LOX would detect light in a very specific energy range that Miller calls the "nuclear energy regime." A supernova explosion is driven by thermonuclear processes — meaning energy is released from the nuclei of atoms. But theorists have shown that there are multiple ways to set up the conditions for a white-dwarf supernova explosion. For example, these explosions could come from a white dwarf that is stealing material from a "normal" star like the sun; but they could also be created by the merger of two white dwarf stars. The stellar arrangement that ultimately produces a supernova is known as a supernova progenitor, Miller said. "This isn’t such a crazy thought," Miller wrote. "There is a range of possible [Type Ia supernova] progenitors that are physically allowed (as far as we know). But whether nature facilitates all of these, a subset, or just one type, makes such open questions relevant." So, are all Type Ia supernovas initiated by the same process, or is there diversity among these stellar explosions? According to Miller, studying these "nuclear" gamma-rays could help answer those questions. Type Ia supernovas are fascinating in their own right, but they are also extremely useful to cosmologists, because they can be used to measure distances to far-off cosmic objects, which is a notoriously difficult problem for anyone who wishes to study the universe. When a Type Ia supernova goes off, scientists can figure out how far away it is based on how bright it appears to be; from there, it's possible to figure out the distance to other objects near the supernova. Type Ia supernovas helped reveal to scientists that the universe is not only expanding, but is doing so at a faster and faster rate. The explanation for that universal acceleration is called dark energy, although the nature of this force is still a mystery. Type Ia supernovas continue to be an important part of cracking that cosmic puzzle. The nuclear energy regime has not been thoroughly studied by space-based gamma-ray telescopes, according to Miller. NASA's Fermi Gamma-ray Telescope, for example, studies much higher-energy gamma-rays than what LOX was designed for. NASA's Swift observatory was designed to study a phenomenon known as gamma-ray bursts, but those bright flashes would be invisible to LOX, Miller said. Trying to capture and isolate photons in the energy range that's targeted by LOX comes with one big hurdle: the background noise near the Earth. Anyone who has ever tried to have a conversation at a rock concert knows about the impact of background noise (although the kind that astronomers deal with isn't literally sound). Astronomers often have to find a way to remove unwanted light signals in order to isolate the light they want to study. Cosmic rays (powerful charged particles from space) collide with Earth's atmosphere and create gamma-rays in LOX's "nuclear energy regime." In addition, the Earth’s magnetic field causes these backgrounds to change throughout a spacecraft’s orbit, so they are difficult to characterize. This limits the scientists' ability to subtract them from the signal without error, Miller said. The last major NASA mission to investigate this regime was called the Compton Gamma-ray Observatory, which flew from 1991 to 2000. That spacecraft was equipped with a Compton telescope, which is an instrument that was configured in part to deal with those background-signals that exist around the Earth. But this approach requires an instrument that is "very complex, power-hungry, massive, low-efficiency and very expensive," Miller told Space.com. To get around this challenge, LOX would orbit Earth's moon, which has little to no atmosphere, immediately reducing one major source of background noise. Cosmic rays collide with the lunar surface and create some background, but because the moon doesn't have a magnetic field, the background noise doesn't change rapidly, the way it does on Earth. Hence, it's easier for scientists to measure the background alone, and subtract it from their measurements of the supernova gamma-rays. Ultimately, the lunar environment would allow for more sensitive measurements in the nuclear energy regime, and so scientists would have the ability to see supernovae much further away. Using the lunar environment to study these supernovas "represents a paradigm shift," Miller wrote. With the ability to observe a source for a full two weeks, LOX would be on the order of "10 [times] more sensitive than next-generation Compton telescopes … and that sensitivity gets better with time." An artist's rendition of the inside of the proposed LOX spacecraft. There's a final benefit to orbiting the moon, and that's the ability to use the lunar disk as a kind of reference object for narrowing down the location of these supernovas on the sky. This ability would help scientists pinpoint the particular galaxy the supernova lives in. That in turn could help scientists learn more about what environmental conditions create these Type Ia supernovas. The LOX spacecraft would use the moon as a point of reference, via a method called the Lunar Occultation Technique, which boils down to something most people have probably experienced while driving long distances in a car: It's possible to gauge the location of and distance to a faraway object by looking at how that object appears to move in relation to objects that are closer to the observer. For example, the size and distance of a mountain on the horizon can be better gauged as the person in the car watches the changing position of a tall building in the foreground. Scientists working on the LOX mission would use precise geometric measurements to determine the location of a supernova, rather than just gauging these distances by eye. As LOX orbits the moon, a distant supernova may at first appear to one side of the moon, until it gradually sets behind the moon, and then rises over the lunar horizon a little later on. Over the course of a few days or weeks, that information can be used to narrow down a precise position for the supernova. Miller and colleagues published a proof-of-concept paper for the technique using data from NASA's Lunar Prospector Gamma Ray Spectrometer (LP-GRS). By learning about the stellar arrangement, environmental conditions, and explosion mechanisms that create an individual supernova, along with the type of galaxy it resides in, scientists could begin to understand the relationship between a supernova and the properties of its home galaxy. A proposal for the LOX mission has been submitted to NASA's Medium-class Explorer (MIDEX) program. Editor's Note: This article has been corrected to state that 10 Megaparsecs is equal to 325 million light-years, not 325 light-years.